Description: This is a blue and white plastic wind-up music box that plays plastic records just like a real phonograph, but requires no batteries! The player is shaped the same as it's predecessors, 1971-1983's #995, and 1984-1987's #995 Sesame Street version. 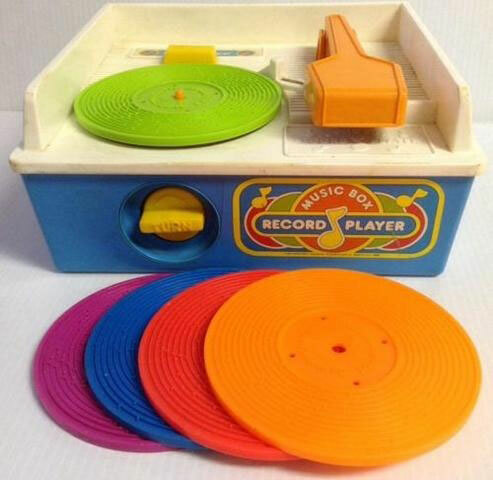 The record player has a hidden compartment that stores the 5 accessory records. An attached carry handle makes for easy portability. Designed for children ages 2 to 6 years old. 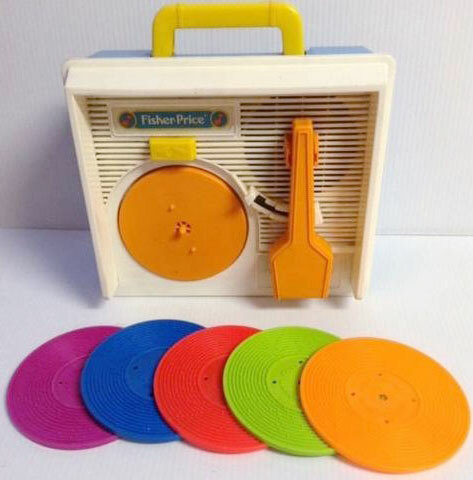 FPT3436 - Blue plastic record player with a white top, orange turn table, orange needle arm, yellow sliding On/Off switch, a round yellow wind-up knob on the front, and a carry handle on the back for portability. The record player has a hidden compartment on the back that stores 5 accessory records. 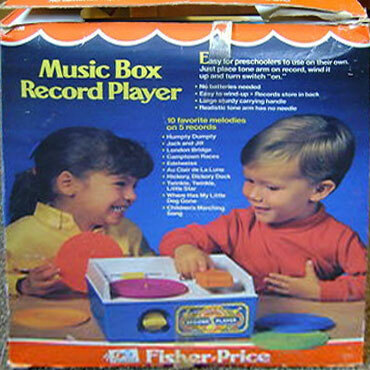 The front of the player has a colorful paper lithograph marked "Music Box Record Player" (NO SIDE LITHOS). The lithograph is often torn or missing. Measures 9-1/4" long, 8-1/2" deep, 4-1/4" tall. FPT8709 - Dark Pink (Fusha) plastic record marked "#1 - Humpty Dumpty - Jack and Jill". FPT939 - Dark Pink (Fusha) plastic record marked "#2 - Twinkle twinkle little star - Au clair de la lune". FPT20366 - Dark Pink (Fusha) plastic record marked "#3 - London bridge - Oh where has my little dog gone?". FPT20369 - Dark Pink (Fusha) plastic record marked "#4 - Camptown races - Children's marching song". FPT20368 - Dark Pink (Fusha) plastic record marked "#5 - Hickory dickory doc - Edelweiss". FPT20362 - Red plastic record marked "#1 - Humpty Dumpty - Jack and Jill". FPT20363 - Red plastic record marked "#2 - Twinkle twinkle little star - Au clair de la lune". FPT941 - Red plastic record marked "#3 - London bridge - Oh where has my little dog gone?". FPT20370 - Red plastic record marked "#4 - Camptown races - Children's marching song". FPT20365 - Red plastic record marked "#5 - Hickory dickory doc - Edelweiss". FP2205BOX1988 (Box ONLY) - Sold in a 9-9/16" long, 10-1/2" high, 4-3/8" deep display box. FP2205SET1988 - Complete set in box. WFL: 07-AG-24-3-A.